Many people need 11x17 paper for printing durable maps, signs, charts or instruction sheets. The papers sold here are much more durable than standard paper. They are all either waterproof or all-weather. Some are puncture-resistant, tear-resistant and abrasion-resistant. All are great for outdoor use in any weather. For detailed specifications on tabloid-size waterproof papers, see a comparison chart here. Works in laser printers, inkjet printers and plain-paper copiers. 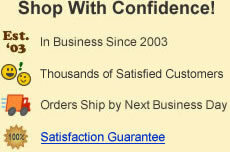 are shipped in 50-sheet packages. Our best-selling 11x17 paper. Weatherproof Paper is a synthetic paper similar to a thin plastic sheet. It is excellent for extreme outdoor, marine, lab, and field use. Use iGage Weatherproof paper when you need a durable waterproof map paper or sign paper. Designed especially for printing topographic maps, this durable, tear-resistant, puncture-resistant and abrasion-resistant. Weatherproof paper has excellent ink absorption, can be folded, glued, embossed or laminated. Printable on both sides and puncture resistant. Each package contains 50 sheets of Weatherproof Paper designed for laser printers, inkjet printers and most plain-paper copiers. Available in 8.5x11 and 11x17 sizes. You can write on Weatherproof Paper with a standard pen, but we recommend using a pen that writes with waterproof ink. Does not accept pencil. Available in two thicknesses: 8 mil (for economy and foldability), 10 mil (for greater stiffness, durability, and printing on two sides). Works in laser printers, inkjet printers and plain paper copiers. Works in laser printers and plain-paper copiers. DuraCopy is a waterproof paper for extreme use. When you spend a long hours working in the field don't take chances with your important notes. That's when to use the best - DuraCopy. Write on DuraCopy paper with a waterproof pen. We also have mechanical pencils with broad, hard leads that perform nicely on this paper and can be cleanly erased. DuraCopy is a synthetic paper similar to a thin plastic sheet. It works great in your laser printer or plain paper copier. Use it when you need multiple copies of forms, maps and signs for outdoor use. It is a synthetic, tear-resistant, puncture-resistant, abrasion resistant, and foldable paper designed for use in extreme conditions. Printable on both sides! Works in laser printers and plain paper copiers. Specially designed for inkjet printers. 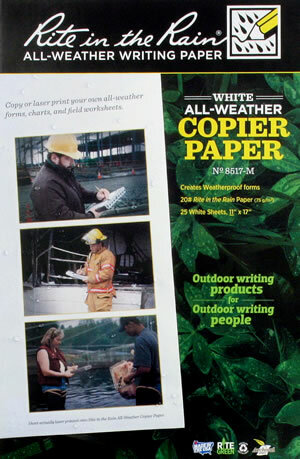 WeatherJet is a waterproof paper for extreme use. When you spend a lot of time working in the field don't take chances with your important notes. Use the best - WeatherJet. WeatherJet was designed for use in inkjet printers. It has a micro-porous surface that turns standard inkjet inks into permanent waterproof images. WeatherJet is printable on both sides! It has a thickness similar to 8 mil plastic. This paper does not accept pencil well and should be written on with a pen. We recommend waterproof pens to protect your important notes. Not tear resistant. Works in inkjet printers only. Rite in the Rain is an all-weather coated paper that works great in a laser printer or a plain paper copier. Use it when you need multiple copies of forms, maps and signs for outdoor use. This is the most economical of the papers that we sell. It costs about 80% less per sheet than DuraCopy and about 70% less per sheet than 8 mil iGage Weatherproof. The trade-off is that it is not tear-resistant and does not perform as well against moisture as a plastic sheet. But, its perfect for light-duty use. Rite in the Rain is a normal paper with a water-resistant coating. You can print on both sides and write on both sides. Works great for topographic maps. Also available in green and tan colors. Rite in the Rain is the perfect choice for most outdoor note-taking situations. You can write on it with a standard pen or use a pen with waterproof ink. Pencils with a broad hard lead also write well on this paper. Our mechanical pencil is perfect for this paper. It never needs sharpening and erases cleanly. This paper has the best performance when writing with a pencil of all the papers that we sell.